Getting involved in a car accident is always difficult, even if it is the slightest incident we’re talking about. It can fill you up with stress, worries, and in the worst case scenario – injuries. And while trying to deal with all of that, you also have to deal with the fact that your car is probably blocking the road and you know that the sooner you are able to clear it from the road – the better. During this stressful time, you are in need of a professional roadside assistance company that will be able to provide you with an accident removal service as quick as possible while making sure everything is in order and that the paperwork is being taken care of. You need a company that will have your back right when you need it the most. You need Newway Towing. 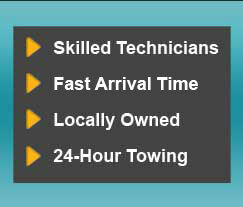 At Newway Towing we perform our services through a network of independently owned and licensed affiliates. The techs we cooperate with will provide you with just the type of service you hope to get and all for a price that’s hard to beat. Newway Towing has got your back in case you need our accident removal service, and we also understand how important it is to provide such services quickly, because a car accident scene is not only a hazard to those involved in it, but also a direct danger to other drivers using the road. Our accident removal services are available for our clients 24 hours a day, 7 days a week, and once we get your call, we promise to be on site within 30 minutes and not a second more. So, it doesn’t matter if it’s on a Sunday morning or a Wednesday night – our team will be by your side in no time. In Need of Our Services in San Rafael, CA? Newway Towing is a local roadside assistance and towing company in San Rafael, CA. We provide the residents of San Rafael with a wide range of roadside assistance services including the most crucial of them all – accident removal service. We are widely experienced and knowledgeable in the city’s different roads and streets, which gives us the advantage of reaching the location of anyone who is in need of our roadside assistance services as quick as possible. It does not matter in which condition the car is, whether it’s standing still or if it has crashed into another car, if it’s barely scratched or if it’s completely misshapen, the most important thing to remember right after an accident is to not attempt to move the car by yourself. You can put your own life in danger, as well as others’ as you may cause another accident. Also, at times, there is the need of having specific accident removal equipment that can only be used by qualified professionals. Newway Towing’s team of professionals is highly trained and qualified in providing high-quality accident removal services in San Rafael and the area. We are also equipped with the most advanced tools and tow trucks to help us face any removal challenges that may come our way. Whether it’s your private car, your motorcycle, or even your truck, we can provide you with the best accident removal solutions for your needs. Have you been in an accident? In need of our services? Just give us a call: (415) 870-3377.